When I heard a youtuber do a let’s play video of Valiant Hearts say “It is kind of a history lesson…” I thought it would be fun to do an assessment of Valiant Hearts and its potential as an educational game, something that could maybe be played in actual history lessons. It took me some time to get around to do it, and I am aware I certainly can’t be the first one doing this sort of analysis of the game, but nonetheless I found it interesting to do so I decided to share it. The first part is just a short recap on Valiant Hearts. The next parts touch upon some of the pros and cons I came up with when it comes to using the game in classroom teaching, and then finally I touch upon how I could see Valiant Hearts used for teaching history in school classes. Enjoy! 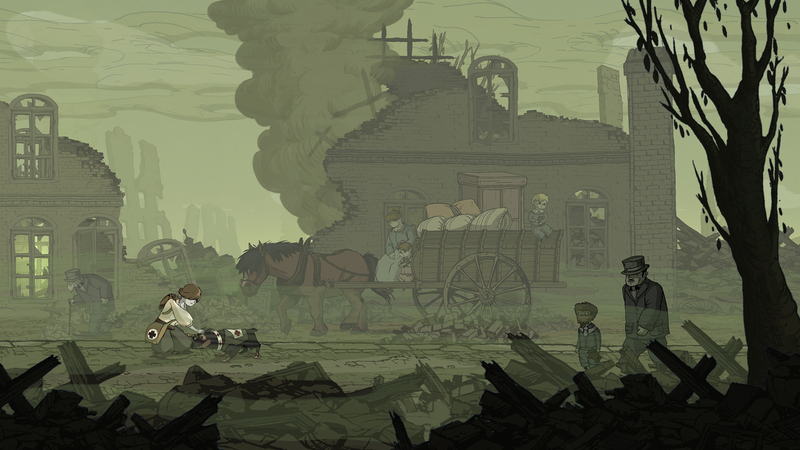 Valiant Hearts is a story driven puzzle platformer set during World War 1. The gameplay mainly revolves around a fictional and rather fantastic story. The main cast of the story is a French farmer, an American volunteer, a Belgian nurse and a first aid dog. Other characters play roles, but those four are arguably the main characters. They travel along the frontlines and somehow always find their way to famous battlefields like Verdun or Passchendaele. The gameplay is mostly about finding your way from point A to B in 2D levels themed around stealth and puzzle solving. Small mini-games sometimes break up the action. As you explore the levels you find items, you have to find them all to get “full completion” for the level. Each item found unlocks a little bit of encyclopedia knowledge about the item. Apart from these items you also unlock encyclopedia knowledge about the battlefield; stuff like who fought, what weapons were used, what effect did the battle have on the overall war effort, death tolls and other historical facts. These items provide encyclopedic knowledge and are very factual and relevant and sometimes woven into the gameplay or general narrative, which should help increase knowledge retention. The conservative teacher should say ‘no’ to using Valiant Hearts as part of history lessons for the following reasons. False information & what to believe? As the game was not made with the pure purpose of teaching history the main game contains false knowledge… false knowledge is very dangerous, when presented it in the context of teaching, as the teacher is an authority and what is taught in the classroom is believed to be the truth. An example of ‘false information’ is the baron who is the main villain in the game. He has never existed in real life, but the game could make the kids believe that a Baron von Dorf was responsible for the use of mustard gas during WW1… wouldn’t look good in the history report. The game layer especially is confusing as parts of it is true, yet hard to believe, and other things are fictional, but may be more believable. For example the dogs of war being equipped with gas masks may seem farfetched, but is in fact real, whereas a Belgian scientist being kidnapped by the Germans during the war to develop weapons isn’t and might seem much more correct. The game hides away the encyclopedic knowledge. Players actually have to find the items, which are purposefully hidden, to unlock the information. Yes this is a game, and parts of a game is challenge, but in a teaching context this can be seen as a big issue: What if people can’t find the knowledge hidden in the level? The analogy being that you are reading the right page of a text book, but all the paragraphs and sentences are scrambled so you have to puzzle them back together before you can read it all. Not very effective. The fact that games are purposefully challenging the player means they won’t be effective learning in this case. The player could just read the encyclopedic knowledge from a fact sheet without wasting time looking for it, solving puzzles etc. to get to the knowledge and it would without question be faster. Here I haven’t even bothered to talk about the technical difficulties in setting up a game in a classroom and some teachers reluctance to let go of control. After all the teacher is held accountable for the learning at the end of the day, so sticking to curriculum and traditional methods is probably the safest way to go. The logistics are in my experience one of the main reasons teachers very rarely use games for teaching purposes. The progressive teacher would however highlight the following elements to promote the use of a game like Valiant Hearts. The exciting story makes it easier for people to remember what happened in the game, as the kids can associate facts with the story. The fact that it is a game and that the players are forced to struggle / work towards to the information might make them retain the gained knowledge longer. A report called “A Meta-Analytic Examination of the Effectiveness of Computer-Based Simulation Games” from 2011 showed that learning by playing simulation games increased long term knowledge retention, compared to learning through traditional means. For their definitions of simulation games etc. look up the report if you are interested it is a good read. World War 1 might not be the hardest sell to kids, it is an exciting action packed few years, but what about those who don’t care too much for the guns? Well they can dive into the drama of the story and be motivated that way, the story involves drama, love and heroics in spades. People not caring for the story can skip it and go directly to the gameplay. The game helps motivate people interested by addressing more than one side of the war in the story, and by allowing those who just want the gameplay to skip the story. Some of the action is placed within a context and makes it much easier to understand for kids. The game explains and allows the player to experience why soldiers wore gas masks, or how civilian lives were affected. The game also allows a look at the bigger picture by showing how the human catastrophe changed the shaped Europe and the views of Europeans. Subjects like the hopelessness of the trenches and how it forced warfare to evolve to a new state is not just told, but experienced through narrative and gameplay. Conclusion can it be used? Assuming that the logistics and everything around using a commercial game in school education is solved - and this is probably the biggest hurdle - I think there are ways of using Valiant Hearts in teaching. Why could it be used? First and foremost using games in teaching may have benefits. Once again I refer to the study mentioned above. The report has some hard hitting numbers such as knowledge of retention being up with 9% and self-efficacy was up by 20% when playing simulation games compared to traditional methods of learning. The numbers apply to simulation games, so a game like Valiant Hearts might not be as effective. Second Valiant Hearts has a nice timeless style, a good story that can appeal to both genders and most age groups. Thirdly I believe that the slow paced style of game play is more inclusive to non-gamers compared to other commercial games might, which decreases the risk the content will be hidden behind a skill-wall. I see it mainly as a supplement, something that teachers can centre assignments around or have as an option to some students. It isn’t really suited for classroom teaching, but it might work as homework or for a feature week on World War 1. As a fact finding mission; have players discern what parts are real history and which aren’t and do a presentation on those or write a small report. It involves playing the game and then be critical towards the content presented to you. Critical thinking is good to promote. So using the game could cater to both classic questionnaire style tests or more creative writing or presentations. The use of a game like this could be helped along a lot if the studio provided tests or just simple quizzes as part of the “extras” in the game which could easily be printed and distributed. Other and better features focused on teaching could further help make a game like Valiant Hearts a game with teaching potential.